JuliaBobbin: FINISHED KNIT No. 2 + Giveaway WINNERS!! FINISHED KNIT No. 2 + Giveaway WINNERS!! I might be now 100 years old, but I've finally finished my second knitted garment. Let me introduce to you the 'It cannot fail to please' sweater/jumper by Susan Crawford. It's a reproduction of a stunning original knit pattern from 1938. I'll always be a sewing girl at heart, but goodness gracious I am loving this knitting thing! There is something truly harmonious about wearing something where you have actually made the fabric, and it has taken you more than 80 hours! It's not something that you just chuck on over your head when you want to wear it, you almost need a freaking ceremony. Or at least someone to throw rose petals at you while you get dressed. It cannot fail to please by Susan Crawford. This bad boy is sewn with with U.S. size 1 and 3 needles so it takes a loooooooong time, but small stitches just look so neat and pretty don't you think? 4 ply Rowan wool in Raspberry (8 skeins). I made this in the medium size and dang it, it's a little bit too big! Not noticeably, but enough to annoy me. 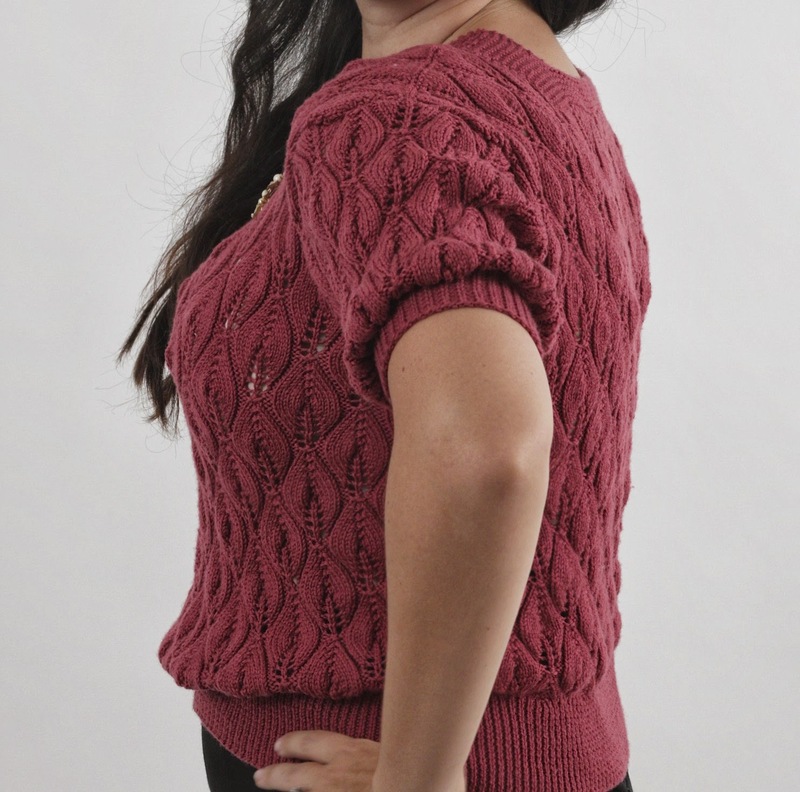 Since knitting my first ever cardigan the Miette, I've come to realise that I'm a loose knitter. That and I really need to swatch better. I used slightly more yarn than the pattern said I would need and after I wet blocked I realised that the sweater is just a bit too big. The shoulders are too long, and it's a little bit boxier than I would have liked around the midriff. This pattern would look better on a smaller bust (not much I can do there) but overall I still think it looks pretty great! The only change I made was to make the sleeves in a small size as I have pretty thin arms and the sleeves are quite full. See how much flatter and even the pattern is? Genius! If you are on Ravelry, you can check out more details about my sweater here. I am in love with the beautiful leaf pattern of this garment. I finished making this top a few months ago and at the time I was so glad to be done with it. Now I miss knitting the repetitive leaf pattern. It's just so pretty and classic looking don't you think? I'm also a lover of all things vintage so I was naturally drawn to this pattern from 1938. I love the the puffy sleeves and the square shape of the neckline. Looks so pretty with a brooch or a flower! 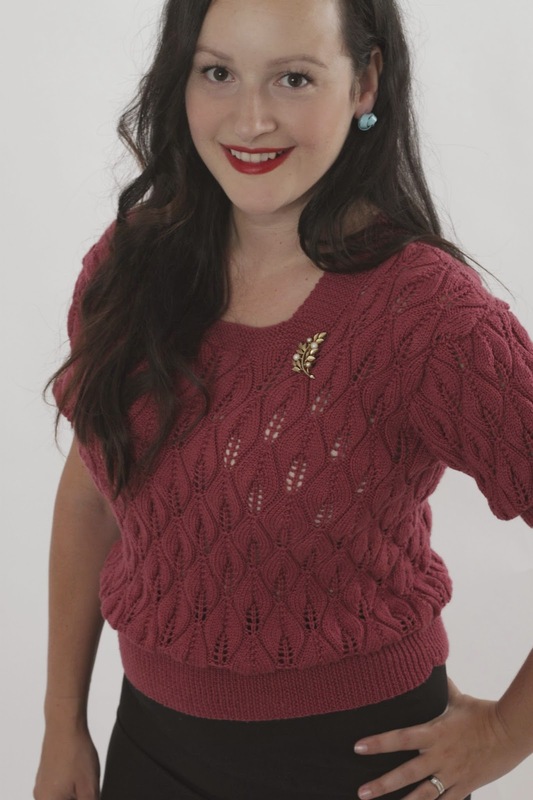 I teamed the sweater with my black pencil skirt, a gold brooch and raspberry heels. Oh and red lipstick too of course! Even though the fit isn't 100% I'm really proud of how it turned out and I'm in love with the style! Susan Crawford has quite a few patterns from this era and I already have about ten that I want to make! Though it's from a different era, I feel like it's the type of sweater that Joan from Mad Men would appreciate, don't you think? Thanks to everyone who commented on my Billie Jean Dress post. These three lucky winners were randomly selected and have each won a fabulous vintage brooch curtesy of Ruemiraldi! Congratulations ladies! I'll be in touch with you shortly via email to organise delivery. Here's a little cuteness for you on your weekend; a dress I made for a dear friend's beautiful 4year old daughter. A self drafted, fully lined dress with a tule underskirt for a perfect little Snow White. Is she not the loveliest thing you've ever seen? I am so in love with your sweater. You have such even stitches! It really doesn't matter it you are a tight or loose knitter, as long as you are consistent. I've been looking for a summer sweater pattern in a small gauge. You may have found it for me. It's such a beautiful sweater! Your knitting is impeccable! Well worth the wait - it looks beautiful! This is beautiful! I've been eyeing that pattern up for a while from that fabulous book, and your version is gorgeous. How gorgeous Julia. Good on you, I'm still knitting my first cardigan which I started a year ago - determined to finish and wear it this winter! Please tell me your husband threw rose petals at you! Your jumper has turned out really nice. I've seen that one on people of all sorts of shapes and ages and it always looks lovely - I keep meaning to knit one for myself! A beautifully knitted top. Everything about is gorgeous: colour, leaf pattern, style. My goodness this is a lovely sweater. You've done a wonderful job. Calls for rose petals at your feet when you're dressing for sure. It's a beauty, Julia! Even if you think it's a wee bit on the large size, I will forever think of it being really very flattering. And such a delectable colour, too. Those teeny tiny stitches! I love the before and after picture of the wet blocking - this has always been something I'd wanted a visual of. 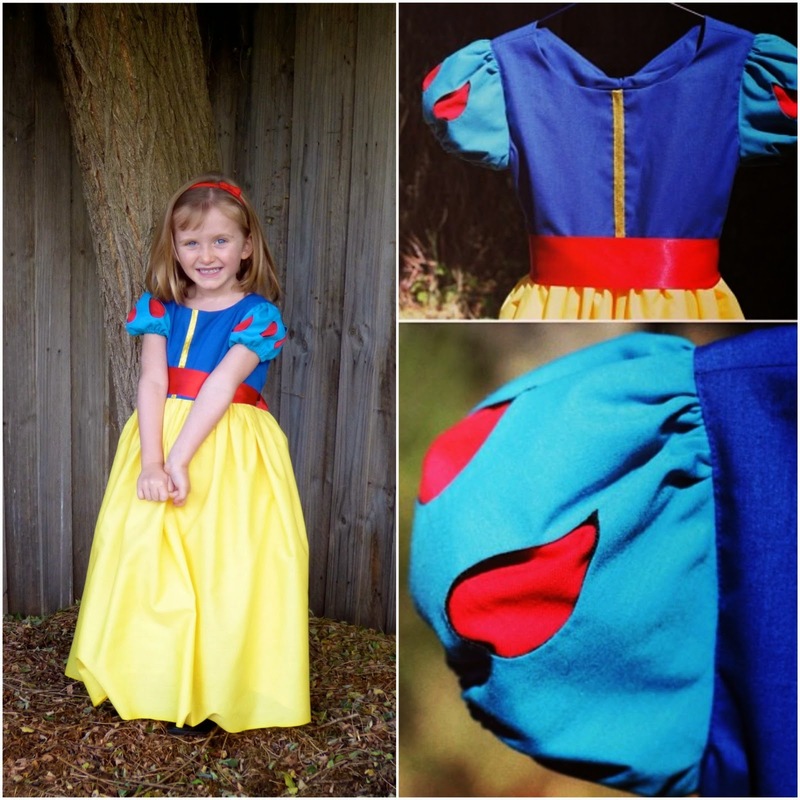 And the snow white dress is beyond gorgeous - what a lucky little girl! This is absolutely stunning and so intricate! and I WON A BROOCH!!! I can't believe it - thank you sooooo much Julia!! 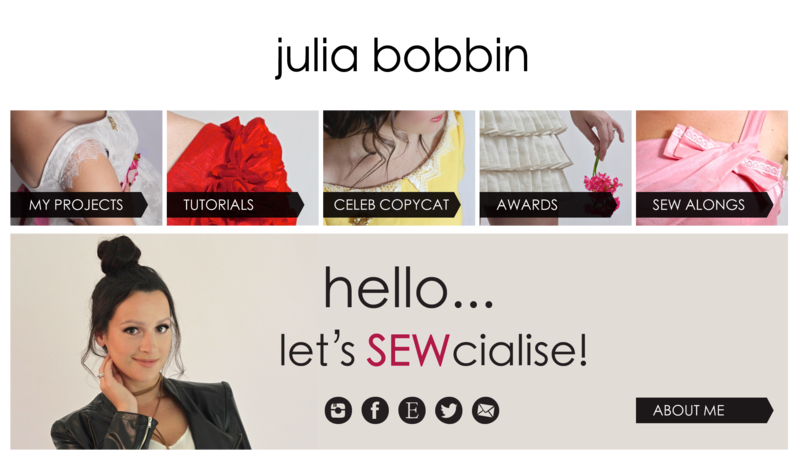 I'll have to start planning my next vintage sew to team up with it. Happy days! It's gorgeous! 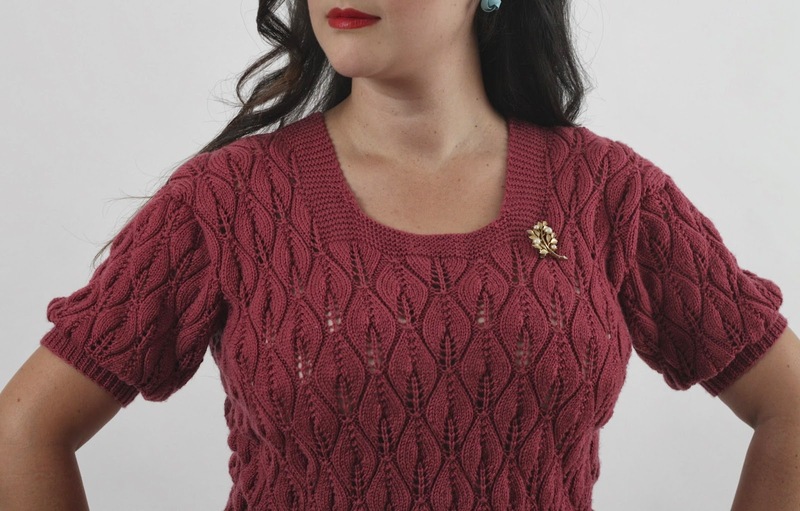 Those Stitch in Time books really are a treasure trove of beautiful vintage knits, and your sweater is yet another example of the loveliness. Congrats on finishing such an involved project! Just beautiful. How did you get so good at knitting in such a short time?! Love your pullover, it perfect, and the little dress to. What a stunner! Kudos to you for sticking with it. The leaf stitch is beautiful. 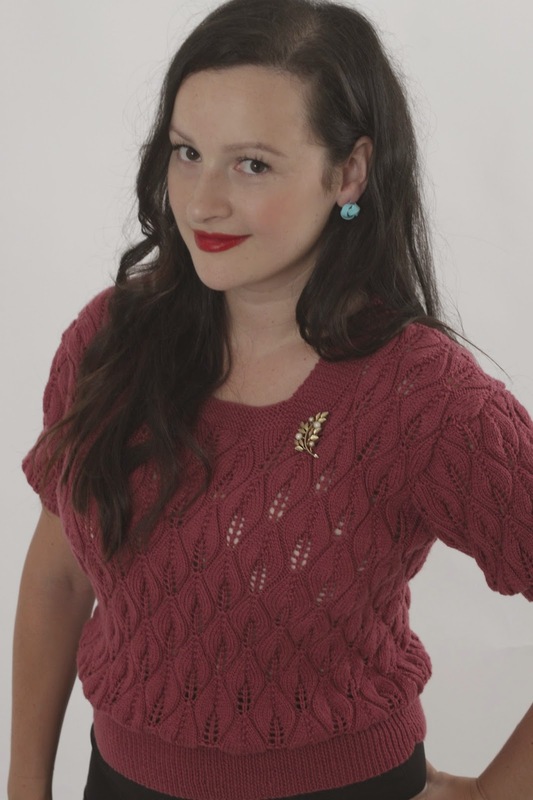 I think you've knit yourself an absolutely lovely timeless piece. The little princess is adorable too. I'm also very excited and thankful for winning one of those stunning brooches! Happy 4th! Seriously, why don't you choose a harder pattern for your second knit? Most people knit a scarf or a dishcloth. You have freakin awesome skills. This is SO BEAUTIFUL. Well done, you! You look absolutely lovely! This is GORGEOUS! So impressed it's only your first project. I wish I had the patience to tackle something like this. But those tiny stitches give me major anxiety! I mean second project. but still! 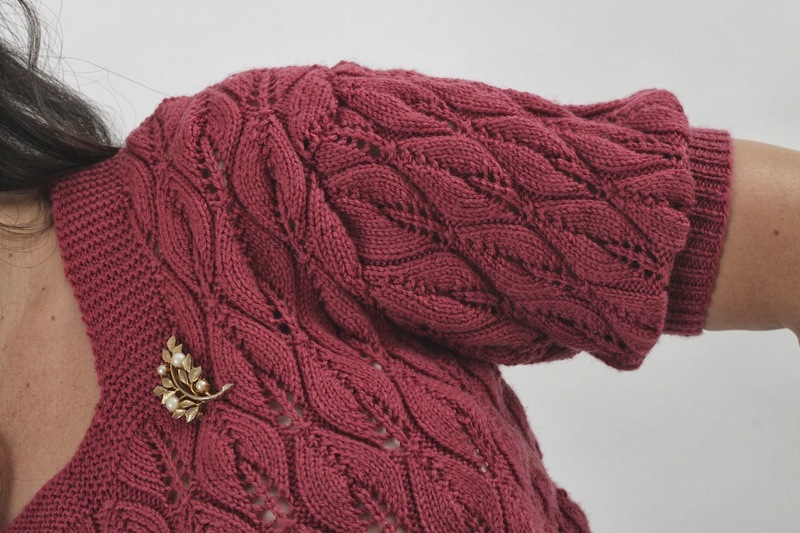 I am taking a knitting lesson in June at the Handmakers Factory and am hoping that the Miette cardigan really is as easy as everyone says it is as my current knitting skills don't extend beyond scarves. I bought some divine wool at the Bendigo Woolen Mill on the weekend so I hope I don't stuff it up! Lovely, lovely sweater. I have added to my list! Love the sweater. 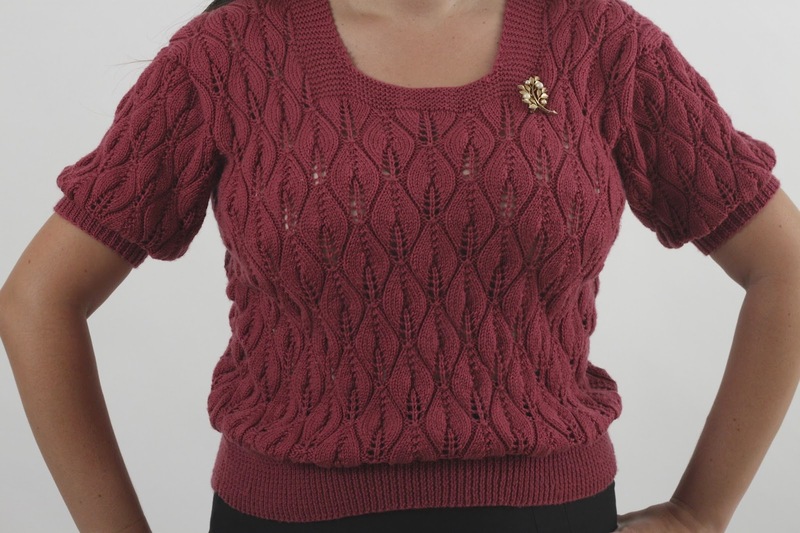 I'm a loose knitter too, so I just knit a size smaller than I think I need, too much hassle to knit on smaller needles! This sweater is simply lovely! You said that the fit bothers you, that you think it is a little too big. I hope you don't worry too much about that; with a fitted skirt or "skinny" pants a loose sweater looks perf! Especially with such a pretty, complicated little knit like you've got here. Love your jumper Julia - the colour is gorgeous. 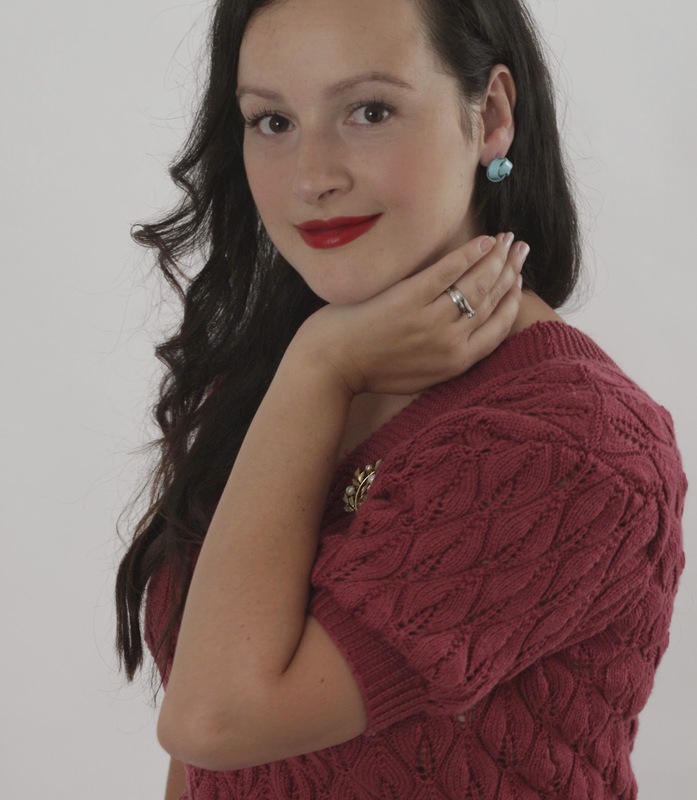 Congratulations to the winners of the vintage brooches and I hope you will be very happy with them. Is everyone loving the new series of Mad Men? I'm looking forward to seeing your next creation Julia. 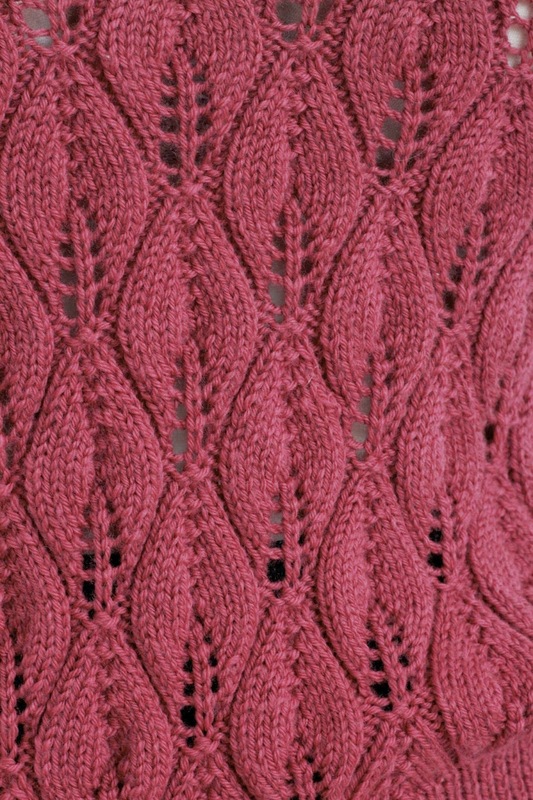 Well done Julia - such a beautiful knit! I agree with you - those itty bitty stitches are so neat & pretty! As for Snow White....you can see the joy on her dear little face! You must be a favourite "Aunty Julia"! Well done again! As for the size of the sweater: it seems bigger than you usually wear, perhaps, but looks great on you. You've already blocked it so you know it won't grow! Good job! OMG your sweater is divine and looks awesome on you. I wish I could knit something this gorgeous. The leaf pattern is just lovely and I love the retro style. 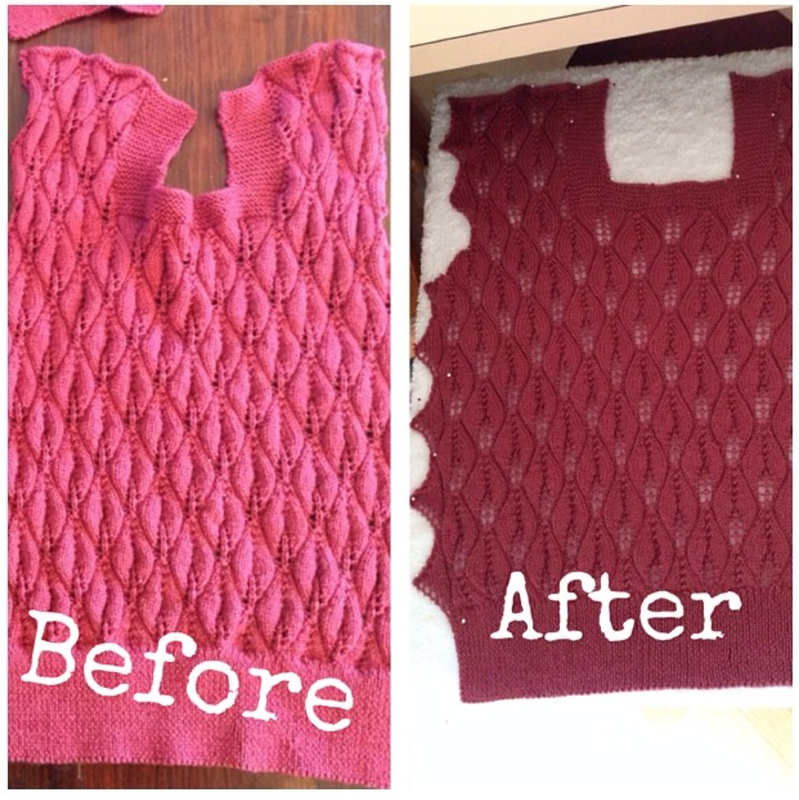 I admire the skill involved and your patience in getting your lovely sweater completed! I've not knitted for years and this makes me want to start again.